Earlier in the year I received an invitation for a junket to the City of Dreams in Macau, but I was completely buried in paperwork... working 7 days a week while trying to launch our new hedge fund, so I politely declined while citing the reason. A few months down the road, and I'm actually not that busy at work anymore... so when the invitation came a second time, I happily accepted the offer to spend 2 days in Macau trying out 3 of the restaurants in the hotel complex. Lunch was at The Tasting Room in the Crown Towers Macau next door, and I was met by Natalie from the City of Dreams who accompanied Hello Kitty and I. We were quickly introduced to Chef Guillaume Galliot, whose cuisine I enjoyed very much on my first visit last year. We took our seats and waited for our 4-course lunch to arrive. But first, a little bubbly. 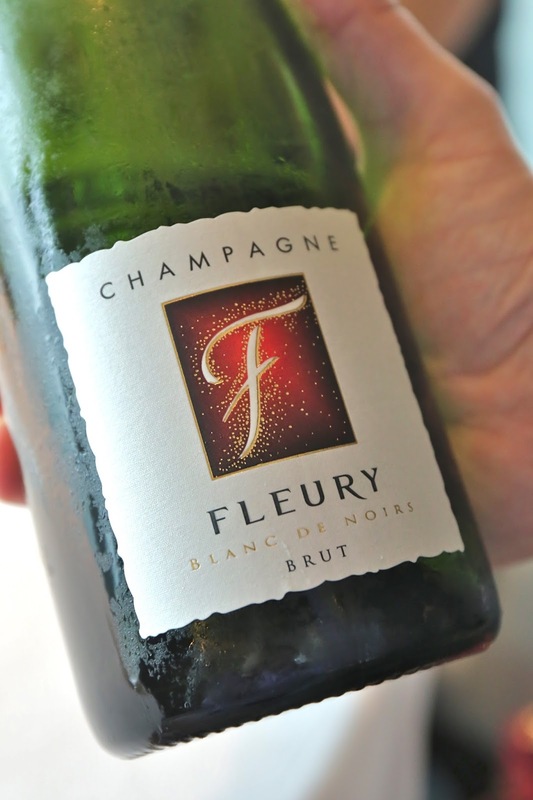 The house very generously offered us a glass of Fleury Blanc de Noirs Brut to start, which was a little yeasty at first, medium-bodied with nice acidity, seemingly nicely balanced. After some food, palate changed and acidity became more prominent. Not wanting to get too drunk from lunch (like I usually do in Macau), I declined the offer of more Champagne... and also nixed the idea of ordering from the wine list. Our amuse bouche was a beautiful beetroot ravioli, stuffed with diced beetroot and obsiblue prawns. When we first heard the words "beetroot", both Hello Kitty and I had speech bubbles popping out of our heads with "........" inside... Well, neither of us enjoy the earthy flavors from beetroot, but we don't hate it enough to list it among our "dietary restrictions". Anyway, we were relieved to find out it wasn't red beetroot but white... which was basically like turnip or kohlrabi. The diced raw obsiblue prawns were sweet and beautiful. Dressed with crab eggs on top and a few dots of mango sauce on the side. Lovely and clean flavors, and a refreshing start to our lunch. Live abalone, carbonara style with 36 months pata negra ham - WOW! So often when we discuss about the best Chinese restaurants, we focus on the chef's knife skills. Here are some serious knife skills on display at a French restaurant. Lately we have seen chefs making noodles out of cuttlefish, such as the beautiful squid carbonara at Amber and the raw version at Noma Tokyo. But now you've got abalone cut into fine shreds, dressed in a creamy carbonara sauce, with onion compôte, shredded pata negra jamón, and a raw quail egg on top as well as a few flakes of Parmesan. Believe me, this was an absolutely beautiful dish. The soft onion compôte contrasted well with the chewy shreds of abalone and the even tougher strands of jamón. The sweet, caramelized onion helped cut down the richness of the carbonara sauce. The finely diced chives were the perfect accent here. Slurp! Thank you, sir... may I have another? I didn't add any, but one could also have a little more of the Parmesan... presented in a beautiful abalone shell. Slow cooked turbot with zucchini mash, corn and Culatello ham, Comté cheese emulsion - the turbot was cooked sous vide and topped with chanterelles and morels. I liked the grilled corn but didn't think the zucchini mash added much to the dish. The Comté emulsion, however, was lovely. It was explained to us that the chef chose not to pan-fry the fish, and here I think he understands the preferences of his Asian clientele... Many of us Chinese (and especially Cantonese) do prefer the beautiful and soft texture that comes from steaming the fish... and sous vide can deliver something similar. Greffeuille lamb with trappeur spices, eggplant caviar - French lamb from a famed supplier in Aveyron, with two different cuts. I loved the shank that has been cooked until tender, with rich flavors. But I can never resist lamb fat... and there was plenty of it on the piece of saddle. Nothing else mattered by the time this was in my mouth... not the artichoke, nor the quenelle of eggplant caviar, and certainly not the pile of seasonal veggies with that sunny-side quail egg on top. In fact, why was this piece of lamb saddle so dainty?! Chocolate banana millefeuille, variation of textures, cocoa sorbet - yes, this is a millefeuille in terms of structure, but that's about it. 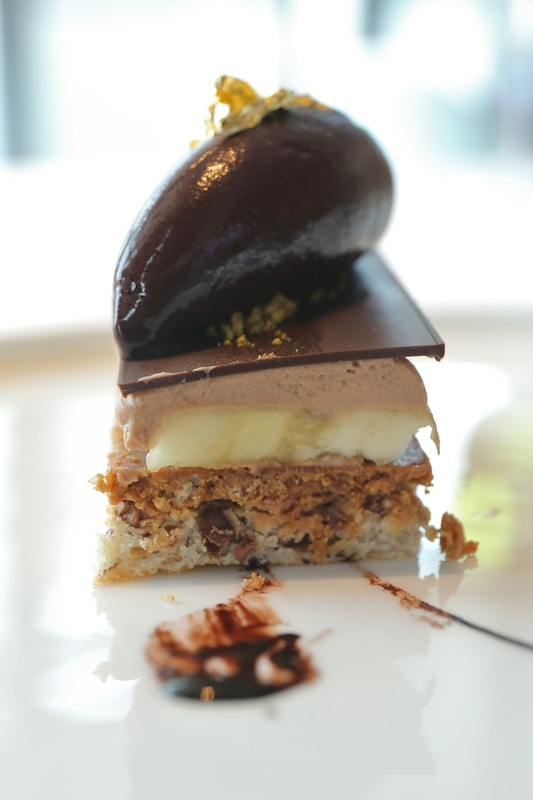 Starting from the bottom, we have almond dacquoise, with bits of chocolate on top, followed by a crunchy layer of crispy rice and chocolate, then slices of bananas, milk chocolate mousse, then a layer of Valrhona dark chocolate. Finally, a quenelle of cocoa sorbet is accompanied with pistachio sprinkles and the seemingly favorite ingredient of many pastry chefs - gold leaf. Besides being very tasty - and these days I am seldom a big fan of chocolate desserts - it really was an interesting combination of textures. A nice way to finish. ...and the petits fours - raspberry pâte de fruits, choux filled with passion fruit cream, and chocolate brownie topped with caramel popcorn.